Race week is finally here - I'll be running my first 50K this coming Saturday at Skyline to the Sea. I go back and forth between feeling incredibly excited and very nervous. I suppose it's normal to feel nervous for a new distance and, if nothing else, it encourages me to think through my race plan more. After a 50K DNS in 2014 thanks to my hip, this whole year has basically been about getting to the 50K start line healthy. I've felt strong throughout the last few months of training and being too excited and confident would likely be worse; there is no need to go out fast and to push too early in the race. 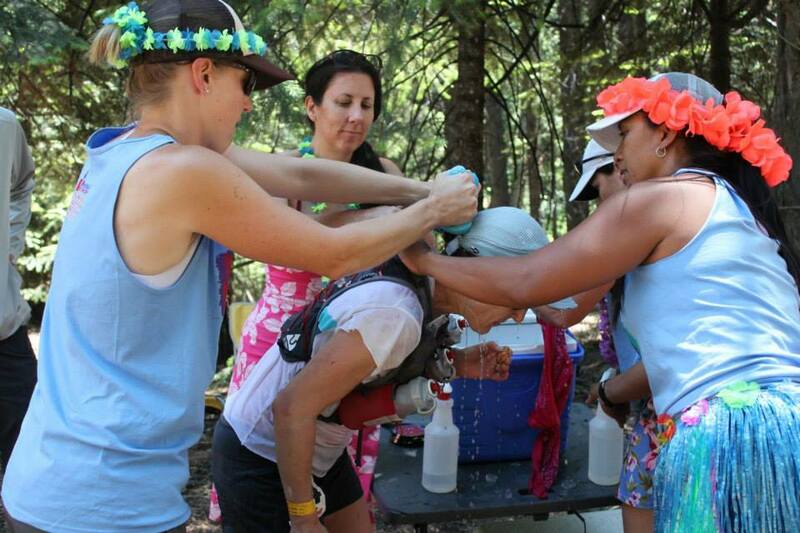 To keep my nerves in check, I often think about my experiences at the Western States 100 mile race. 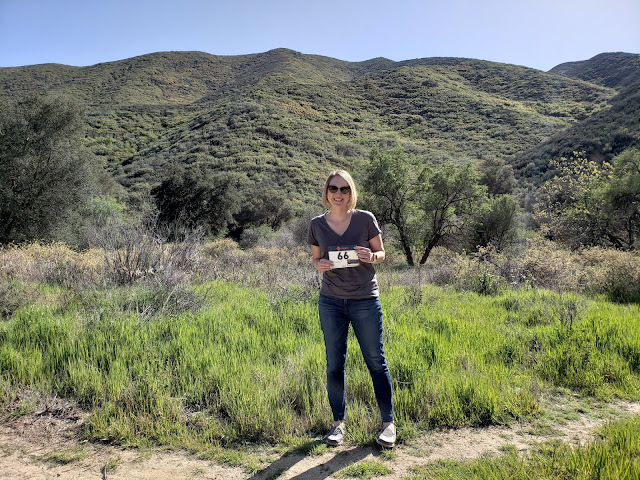 Between crewing for Matt in 2014 and volunteering at Last Chance in 2015, I witnessed seemingly-normal (but tough-as-nails) people doing amazing things that truly changed how I think of running long distances. Granted, a 50K is nowhere near a 100 miler, but we all start somewhere, right? 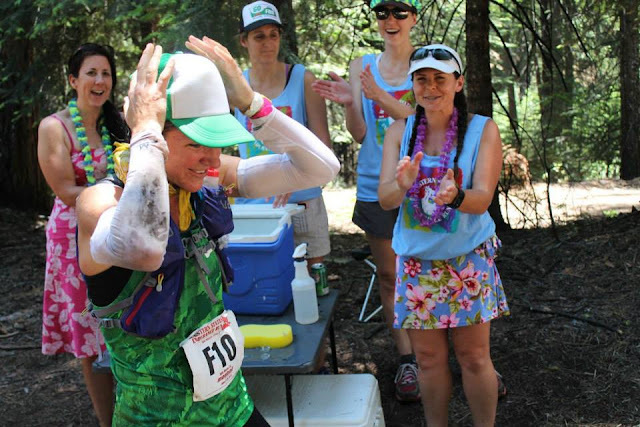 So what happened at Western States this year that was so inspiring, you ask? Everything. It was 30 hours of magic from hanging out with the trail community to supporting runners to witnessing Gunhild Swanson be the oldest woman in history to finish - with only 6 seconds to spare. I get chills just typing this paragraph. Let's back up a bit though. Crewing for our friend Matt was such a cool experience that I wanted to be part of Western States again this year, and I feel lucky to have joined the Steven's Creek Striders group at their aid station. Andrea and I left the Bay Area at 3:30 am on Saturday morning and drove to Last Chance to arrive by 8:30 am. This aid station is on part of the course, so everyone has to be in before the first runners and can't leave until the sweeps come through. I started out as one of the 'Car Wash Girls' who helped to soak each runner in water and ice before they headed back out into the heat. Western States is generally hot, and keeping the core temperature down is key. Last Chance is at mile 43.3, so it's pretty early in the race but at the heat of the day for basically everyone. After this aid station, runners have a downhill section and then face the big Devil's Thumb climb. Volunteering with Go Far friends Isaac and Andrea. The anticipation is fun; who will be be the first runner through? Who will be the first woman? It's awesome to help out the elites (yes, I'm a little star-struck!) but just as awesome to support the later runners as they come through. Later I switched to 'greeting' the runners. This means meeting them at the entrance, finding out what they need, and getting it for them. For example, filling packs or bottles, helping with drop bags, and so on. As the day continued, we saw runners in all kinds of situations. Severely tight muscles, major stomach issues, people who were really sick, bathroom issues, and so on. I'm being vague here, there were some rough situations. However, the majority of times I thought to myself that a runner would be dropping at Last Chance due to the above mentioned issues, they DID NOT. They rested, did some trouble-shooting, pulled it together, and moved on. It's pretty crazy what a person can do when they put their mind to it. One person in particular left me in tears when he finished, and that was Mike from Stevens Creek Striders. I don't even think he knows who I am but he made a difference in my running life and in believing in myself. Mike was looking fine at Last Chance, but when we went to cheer for him at Foresthill he was behind schedule. His wife said he was stopped at Michigan Bluff for around 40 minutes due to some medical issues, and even though he was on his way to Foresthill it didn't sound good. Andrea and I headed out to grab food because it was almost 9 pm by this point, and we thought he would drop at Foresthill. We ate, pitched our tent at Placer HS in Auburn (the finish line), and cheered for runners as they crossed that night. We missed the early men but made it in time to see Magda win the women's race. Finally we went to sleep-ish for a few hours, although runners are literally finishing all night long. I listened to the announcers from the tent and enjoyed the stories being told as the runners entered the track. The finish line at night. When we exited the tent in the morning we saw a few Striders - and they told us Mike was about to finish. To finish! After hearing talk the night before and assuming he would have to drop, I was ecstatic. We cheered him in and continued to cheer for many other runners as they finished. Each and every one of these people impressed me with their strength. By now you may be wondering how this is relevant to my 50K coming up on Saturday, but believe me it is. I observed and learned quite a few things at Western States, and I'll be using a few key takeaways in my own race on Saturday. Lesson One: Races won't go perfectly and problem solving is key. My stomach might get upset or I may get side cramps, I might need a restroom stop (or multiple), and it might feel rough. Taking a step back to fix nutrition and resting a bit if needed is ok. The body needs what it needs. This was already a key mindset when I felt off mid-SF Marathon because I allowed myself to think through it and to give my body the pit stops and fuel that got me through the rest happily. The longer the race, the more important this will be. Lesson Two: Keep the core temperature down. Sometimes the weather doesn't cooperate and it heats up, which used to completely freak me out. In fact, my Saturday race has a forecasted high of 85 degrees! My plan is to use ice in my pack, carry plenty of water and Skratch, to dump water over my head when possible, and to use a neck bandana with ice and cold water. Lesson Three: We are stronger than we think. Running can be hard, climbing and technical trails can be even harder (but more fun! ), and I can do it! I'm feeling like I'll be able to finish this 50K even if it takes me until the cut off, and that's what I intend to do. I love volunteering at ultras! Those are some good lessons to keep in mind. Good luck, and I'm looking forward to your race report! You sound like you're ready! One more thing I would add is: you don't get a second chance to do your first ultra, so ENJOY! Take it all in and don't forget to smile every so often. Good luck! !